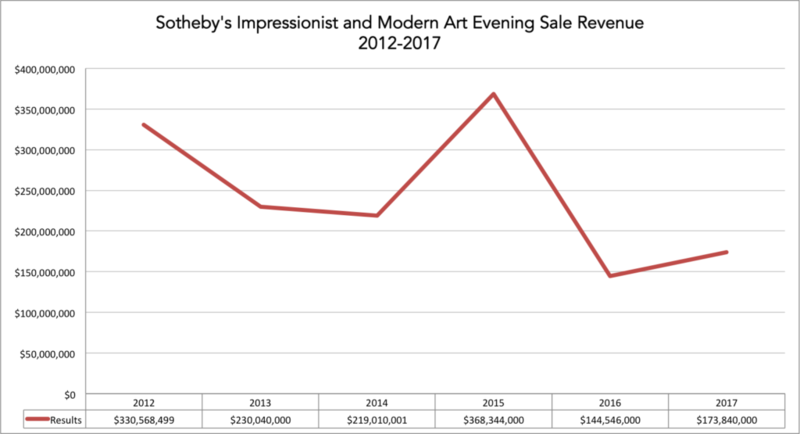 Though hardly exciting, and for the most part, hum drum, apart from a few bouts of auction fever, Sotheby’s Impressionist and Modern evening sale pulled in a respectable $173,840,000. Thirteen of the 50 lots offered failed to sell for a flabby buy-in rate by lot of 26 percent. The tally fell comfortably midway between pre-sale expectations of $147-210.4 million. That estimate was shaved by $30-40 million after the 11th hour withdrawal of the cover lot, a 1909 Egon Schiele painting, pulled at the request of the seller. Still, the result easily exceeded last May’s $144.5 million sale for the 41 sold lots and a steeper 34 percent buy-in rate by lot. A dozen lots tonight were backed by so-called irrevocable bids, better known as third party financing or in combination with house backing totaling $52.5-75.7 million. Twenty-seven of the 37 lots that sold made over a million dollars and of those, five sold for more than $10 million. Four artist records were set. All prices reported include the hammer price plus the incremental buyers’ premium for each lot sold, calculated at 25 percent of the hammer price up to and including $250,000, 20 percent of any amount in excess of that, up to and including $3 million and 12.5 percent for anything above that mark. Estimates do not include the buyer’s premium (the entire sale hammered at $149.2 million before fees). The evening got off to a promising start with Alexander Archipenko’s polychrome wood sculpture in blue hues, “Seated Figure” from circa 1917 that sold for $564,500(est. $100-150,000) and a fan shaped Paul Gauguin, “Ondine (III) and Étude Pour Joies De Bretagne (A Double-Sided Drawing)” in gouache and watercolor heightened with pastel on paper from 1889 that brought $636,500 (est. $600-800,000). London dealer Offer Waterman was an underbidder on the Archipenko. The work previously sold in June 2015 at the Richard Opfer Auctioneering Inc. in Maryland for $425, quite a shrewd bargain for that buyer/flipper. Another Archipenko, the 41 5/8 inch high bronze, “Blue Dancer,” conceived in 1913 and cast in 1964-65, sold to another telephone bidder for $1,932,500 (est. $1.5-2.5 million). It was backed by a third party guarantee and previously sold at Sotheby’s New York in November 1997 for $680,000. Another choice work on paper, Henri Matisse’s charcoal and estompe rendition of a seated female figure, “Tete de Femme” from 1950 and measuring 20 ¾ by 15 7/8 inches, also sold to a telephone bidder for $372,500 (es.t $300-500,000). The price point scale jumped dramatically higher with Max Ernst’s stunning and large-scale bronze the chess themed “Le Roi Jouant Avec La Reine” from a 1950’s cast and sold from the private collection of the late painter Robert Motherwell and his wife, Renate Ponsold Motherwell. The rare and brawny bronze attracted ten bidders and set off a raging and drawn out contest between a bank of anonymous telephones, finally selling for $15,987,500 (est. $4-6 million). It was backed by an irrevocable bid though it hardly needed it. Set on a richly patinated butcher block stand, the bronze king and queen seated on a bronze chess board, entered Motherwell’s collection in 1973. Both Ernst and Motherwell were both avid players and close friends and Motherwell originally received the plaster model of the sculpture from the artist and safeguarded it from Ernst who was unhappy with its neglected reception and intended to destroy it, according to the catalogue entry. Motherwell eventually had the original plaster cast in bronze at the Modern Art Foundry in Queens and Ernst arranged to gift one of the casts to Motherwell. The last time a “Le Roi Jouant” bronze appeared at auction was in November 2002 when it made $2.4 million, until tonight the highest price for an Ernst sculpture at auction. Sculpture played a dominant role in Sotheby’s auction, tallying a chunky $54.1 million, thanks in large part to a pristine trove of bronzes from New York public relations man and avid sculpture photographer David Finn. Lavishly featured in the catalogue under the enthusiastic heading, “Shaping a Legacy-Sculpture from the Finn Family Collection” realized $26.9 million for the five works that sold, all backed by irrevocable bids. Of those, Jean Arp’s shapely torso, “Torse des Pyrénées” from a 1962 lifetime cast made a record $4,850,000 (est. $1.5-2.5 million) and Henry Moore’s “Seated Woman” a lifetime bronze cast in 1960 and scaled at 62 7/8 inches high brought $7,437,500 (est. $4-6 million). London art advisor Hugo Nathan of Beaumont Nathan was the underbidder on the Arp. Another Finn entry, Alberto Giacometti’s iconic portrait of his younger brother in bronze, “Buste de Diego” from a 1957 cast realized $10,925,000 (est. $10-15 million). The lesser known Germain Richier and her towering, 87 7/8 inch high “Don Quichotte,” conceived in 1950-51, went for a record $3,012,500 (est. $1.5-2.5 million). Another version of the literary seeker sold at Sotheby’s Paris in June 2014 for €1.66/$2.2 million. Though not exactly a stand alone sculpture, and more fitting for a design auction, Diego Giacometti’s stunning, room sized library festooned along the top with cast animal figures, “Bibliotheque de l’lle Saint-Louis” in wood, metal and bronze from circa 1966-69, sold for a record $6,312,500 (est. $2-3 million). It was featured in last June’s Design Miami Fair in Basel where it sold for what is understood to be a €2 million figure. Like the small Arp, a fast thinking buyer made a justifiable killing tonight. Among a largely underwhelming group of Impressionist era fare, Claude Monet’s blue sky view of Vétheuil from 1880, depicting a scenic town where Monet and his family lived from 1878-1881 and first exhibited at Galerie Bernheim Jeune in Paris in 1911, sold to a telephone bidder for $5,075,000 (est. $4-6 million). A Pointillist styled and color infused Paul Signac landscape of Saint-Tropez, “Le Pin de Bertaud” from 1899-1900 sold to another telephone bidder for $4,062,500 (est. $3.5-5 million) and a tranquil Alfred Sisley townscape featuring the reflections of the river Loing, “Le Loing au Dessous du Pont de Moret” from 1892 sold to yet another telephone bidder for $3,432,500 (est. $3-4 million). The Sisley last sold at Christie’s New York in November 1993 for $1,102,500. All three works were financially backed by third parties, and that was also the case with Pablo Picasso’s late yet jaunty and cavalier like “Tete d’homme” from 1969, a swashbuckling oil featuring a bearded musketeer type that sold again to the telephone for $10,925,000 (est. $8-12 million). New York dealer Christophe van de Weghe was the underbidder. Most of the big lots carried financial backing, including Claude Monet’s murky and fragment like “Le Bassin aux Nympheas,” stamped with the artist’s signature and dated 1917-1920 that sold to the telephone for $15,987,500 (est. $14-18 million). Late Monets that were signed by the artist carry considerably more market weight as opposed to those that were left in his studio and stamped posthumously by his dealers. It last sold at Christie’s New York way back in November 1989 for $3.85 million. The range of artistic styles and periods made for a somewhat interesting though mixed evening, at least art historically speaking, as a fantastically rendered and early Edgar Degas, “Petites Filles Spartiates Provoquant des Garcons”, an oil on canvas from 1860 and featuring, as the title informs us, a group of youthful nudes, sold to a telephone bidder for $6,087,500 (est . $4-6 million). The full-scaled masterpiece of the same subject resides in London’s National Gallery of Art while two of the other studies are harbored in the Art Institute of Chicago and the Harvard Art Museum in Cambridge. Hugo Nathan was the underbidder. Other highlights included a richly provenanced and widely exhibited Giorgio de Chirico Metaphysical period composition, “Il Sogno de Tobia (The Dream of Tobias)” from 1917 that sold to New York art advisor Gabriel Catone of Ruth Catone for $9,237,500 (est. $5-7 million). 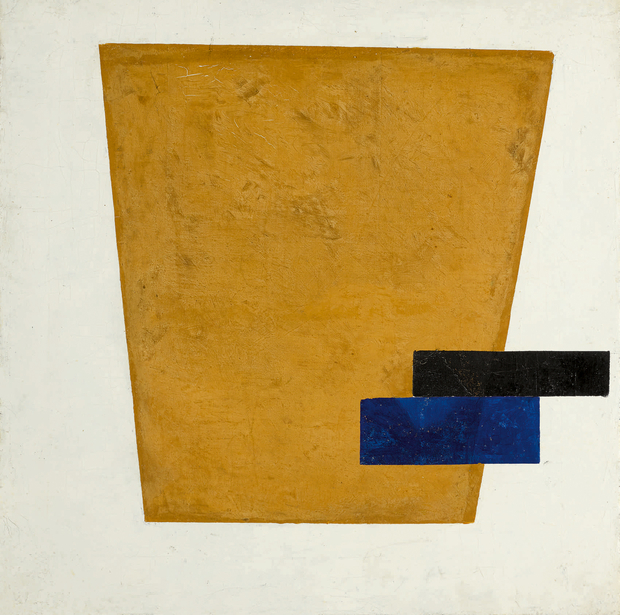 But it was a rare to market Kazimir Malevich oil on canvas, “Suprematist Composition with Plane in Projection” from 1915 and most recently featured in the artist’s acclaimed Tate Modern retrospective in 2014 that captured the fancy of the salesroom and realized the evening’s top lot price of $21,162,500 (est. $12-18 million). Though slow to catch fire, three determined telephone bidders drove the price well past its estimate. The evening action resumes on Wednesday at Christie’s Post-War and Contemporary Art sale. This entry was posted in Auctions and tagged Alberto Giacometti, Alexander Archipenko, Claude Monet, Germain Richier, Giorgio de Chirico, Hugo Nathan, Impressionists, Jean Arp, Kasimir Malevich, Max Ernst, Offer Waterman, Richard Opfer, Robert Motherwell, Sotheby’s. Bookmark the permalink.